High-efficiency scrubbers that remove particulate or gas from air streams with moisture or high temperatures. Particulate Scrubbers, often called Venturi Scrubbers, are effective at removing particulate from the exhaust with high efficiency. 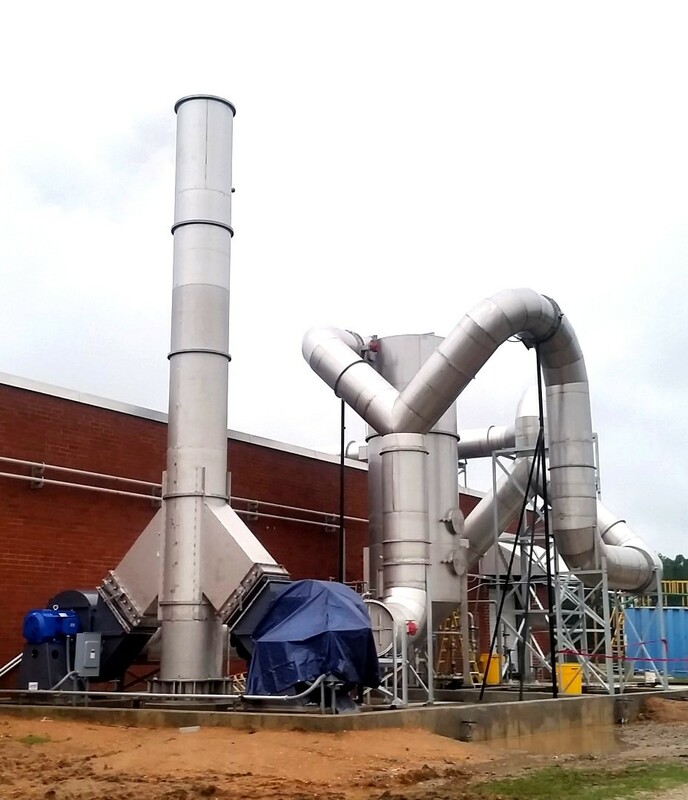 Particulate scrubbers have several advantages compared to other dust collection equipment. They are able to handle gas streams that contain moisture and/or are high temperature, the overall size of the equipment is typically smaller, and they have the potential to remove pollutant gas at the same time as the particulate. Check out our Cut Sheet for the Multi-Vane Venturi Scrubber. Venturi scrubber systems incorporate a scrub-bing vessel with a system fan, recycle pump, instrumentation and con- Multi-Vane Scrubber trols, mist eliminator, and exhaust stack. Wet scrubbers remove particles from gas streams by capturing the particles in liquid droplets and then separating the droplets from the gas stream. Particle-laden exhaust gas enters the scrubber where it becomes in contact with a mist of tiny droplets of scrubbing fluid. The fluid is separated from the gas to remove the particulate. Collection efficiency is typically in excess of 99%. Pollution Systems’ high-quality design and construction also incorporate self-cleaning features to maintain high on-stream performance. Some of the more common industrial applications of Venturi Scrubbers include Corn Processing Facilities, Food Manufacturing, Fiberglass & Composite Industries, and Metal Finishing Operations.